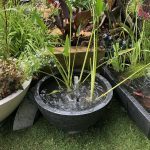 This patio pond is comes in both black & white and measures 75cm round and 35cm high. These patio ponds are made from poly-terrazzo. Which is designed to be extremely durable but light-weight and modern. 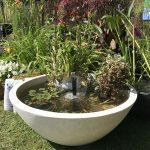 These ponds offer a great alternative to more expensive real stone options. Included in the price: Large Round Patio Pond, fountain pump and plants (our choice). 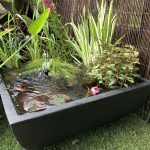 This patio pond is black in colour and measures 75cm square and 30cm high. Included: Large Square Patio Pond, fountain pump and plants (our choice). 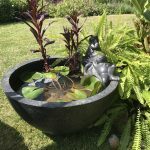 This patio pond is black in colour and measures 55cm round and 30cm high. Included: Small Patio Pond, fountain pump and plants (our choice). These patio ponds are made with a Rattan finish. 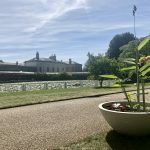 This little pond is designed to fit in your contemporary outdoor furniture. The rattan cover goes over a durable water proof box again light-weight and modern. 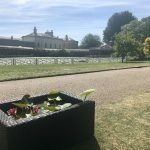 Included: The Rattan Patio Pond, fountain pump and plants (our choice).